You find custom builders in the most unlikely of places. A month ago, we featured a bike from Hong Kong for the first time; today, we’re showing our first custom from Siberia. It’s a little different to our usual fare, but bear with us. 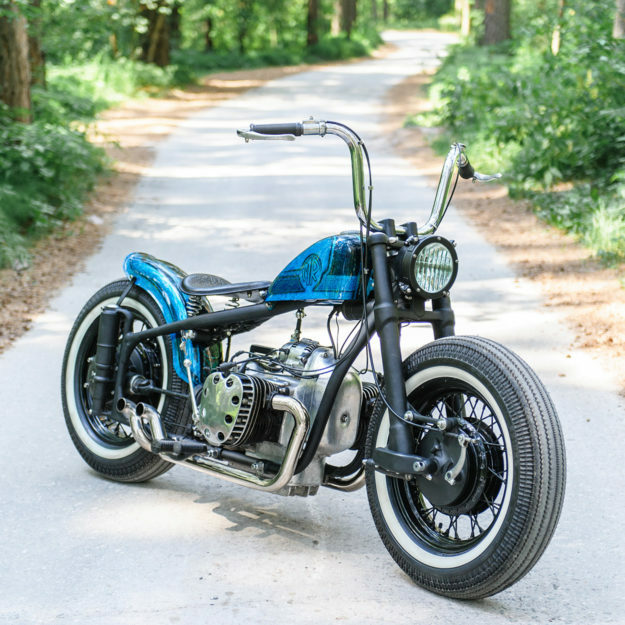 This rather stylish little bobber-flavored Ural chop comes from the small but well-equipped workshop of Roman Molchanov, who lives in Novosibirsk—the third biggest city in Russia. 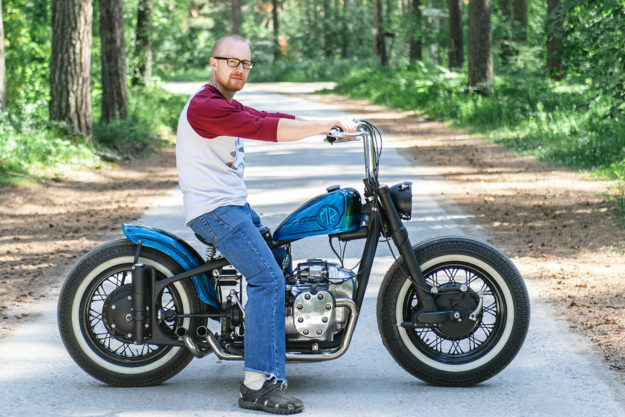 It’s about 900 miles (1,500 km) east of Irbit, where Ural motorcycles have been made since 1941. Roman’s Ural is a little younger than that, but not much: it’s an IMZ M72 built in 1954. 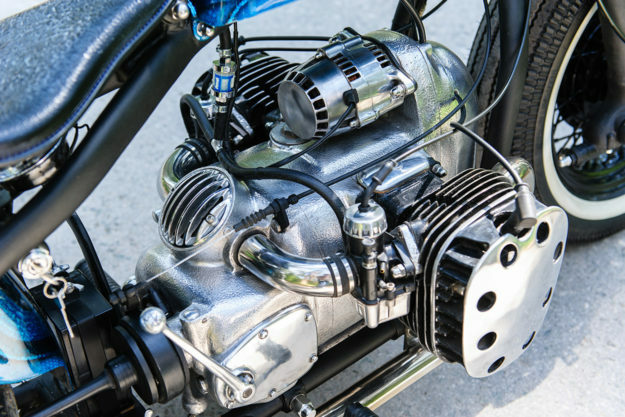 The M72 was a reverse-engineered version of the late-1930s BMW R71, hence the similar-looking cylinder heads with eight visible boltholes on either side. The custom motorcycle scene is small in Siberia. That’s not surprising, given the climate—the average daily temperature in midwinter is somewhere around 3 °F (-15 °C). Still, that hasn’t detered Roman from building around 30 bikes so far. It’s no secret that the build quality of early Urals was somewhat suspect, so Roman stripped the M72 down to the frame, removed the brackets he didn’t need, re-welded the ones he did, and tidied up all the seams. 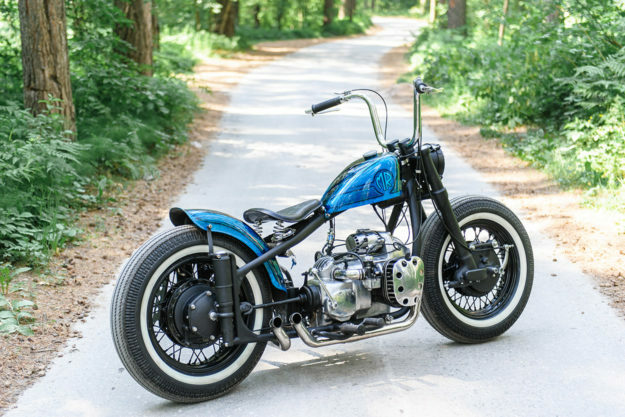 He’s also completely rebuilt the forks, shortened them five centimeters and fitted modern internals—plus custom triples to accommodate the wider wheel. 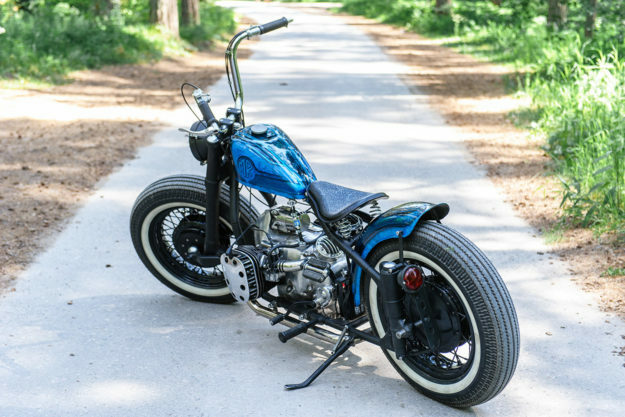 The front wheel is a back wheel from a Kawasaki Vulcan 800, and the back wheel is custom-made from odd parts. Since it’s wider than the original wheel, Roman had to ‘spread’ the twin spars of the rear frame, but the look is nicely OEM. The original shocks are refurbished: after all, piggyback Öhlins would look a little out of place here. But the tires are spot-on: Shinko’s 270 Super Classic, in 5.00-16 size front and back, and just perfect for the vintage vibe. Roman describes the tank as a generic catalog item, so we don’t know its exact provenance. 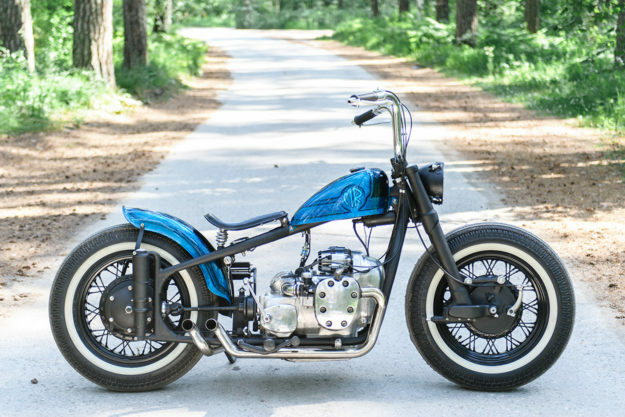 But we do know that the headlight was lifted from a Russian tank, the taillight from an old truck, and the rear fender is hand-fabricated. 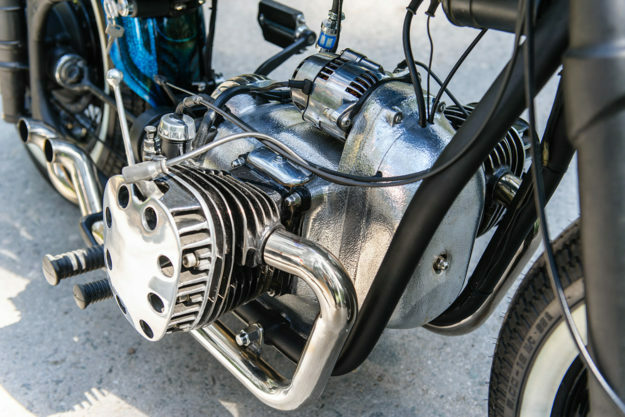 The motor has had a total refresh, and Roman’s built a custom stainless steel shorty exhaust system with hidden baffles. 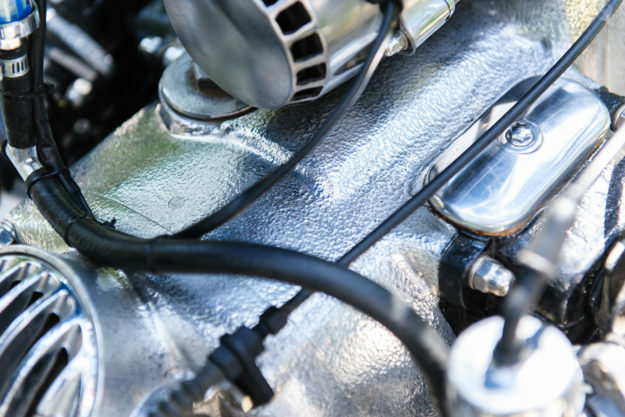 (“Without unnecessary kitsch.”) There’s also a Denso alternator for reliability’s sake, but it’s the dimpled finish on the engine cases that had us most intrigued. After polishing the cases, Roman pounded them with a tiny hammer over two weeks. And he’s calculated that there are around 150,000 little hits in there, to get the textured effect. He has a point. And he’s built one of the most unusual machines we’ve seen in the history of EXIF, with lovely attention to detail and a refreshingly original concept. What’s Russian for “Hats off”?